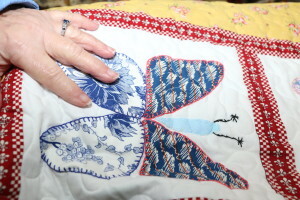 Brandon Twp.- The small ragged quilt was nearly 90 years old. Carefully handsewn butterfly squares adorned the aged shredded heirloom. 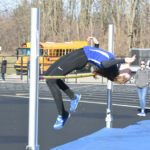 “It needed some repair,” said Sheila Newton, a 76-year-old township resident, former British citizen and lifelong seamstress. Earlier this year Newton had received the family quilt from Lake Orion resident Barb Kirk to make the some repairs. 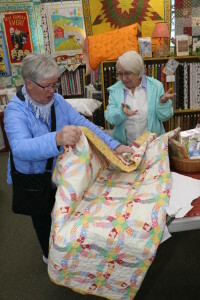 Soon after the quilt was given to Newton for the repair, it was stolen along with her sewing machine while her car was parked in the driveway of family’s township home. Despite efforts by sheriff deputies to find the quilt and sewing equipment it was never returned. To make matters worse, Newton had no phone number to contact Kirk regarding her stolen quilt since Kirk’s contact information was with the quilt. Newton was devastated after the quilt was stolen. So, Newton who sewed regularly at Mabelena’s Quilt Shop, 470 Mill St., Ortonville, purchased 1930s era fabric as close as possible to the original while Brenda Heffernan owner of Mabelena’s created the pattern. Then last month the replacement quilt was completed and presented to a suprised Kirk at Mabelena’s.